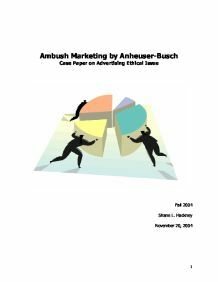 Ambush Marketing by Anheuser-Busch Case Paper on Advertising Ethical Issue Fall 2004 Shane L. Hackney November 20, 2004 The NFL has more than 20 sponsors, who together pay more than $100 million in sponsorship fees. Anheuser-Busch shared official NFL beer status with Miller up until last year when Coors signed a five-year pact that gives it an exclusive beer sponsorship. As with some NFL sponsorships, Coors signed a complex pact that set out side deals on how much advertising it will run on networks televising league games. Over the five years, Coors will pay an estimated $300 million in sponsorship fees, TV advertising and promotional marketing (Murphy, 2004). This year the Super Bowl is in Houston, Texas and Coors has paid a large amount of money hopping to effectively market their product to gain revenues from its competition. Anheuser-Busch will be holding Bud Bowl events in Houston during Super Bowl week. Such events are ambush marketing but more specifically could be classified as a specific type of ambush marketing called guerrilla marketing. After the many years Anheuser-Busch has been an official sponsor of the NFL, do they feel the marketing approach to this years up coming Super Bowl is fair? ...read more. Sponsoring Company (Coors) Coors has paid three hundred million dollars for an exclusive sponsorship in relation to the NFL. They do not want Anheuser-Busch or any other vendor advertising messing up their investment. But what can Coors do about the situation? Not much. As Curthoys and Kendall noted: The law as it stands seems unable to accommodate the concerns of official corporate sponsors. There is no limit to human ingenuity. As such, ambush marketing as the margins will arguably always occur (Curthoys and Kendal 2002 par 78). As a competitor of Anheuser-Busch, with a lot of money invested, Coors is taking a gamble that the official sponsorship will yield better results than if they would have, like years past, participated as a non-sponsor. For those finding themselves on the working end of an ambush marketing campaign, the real question is one of ethics. Is ambush marketing an ethical business practice? 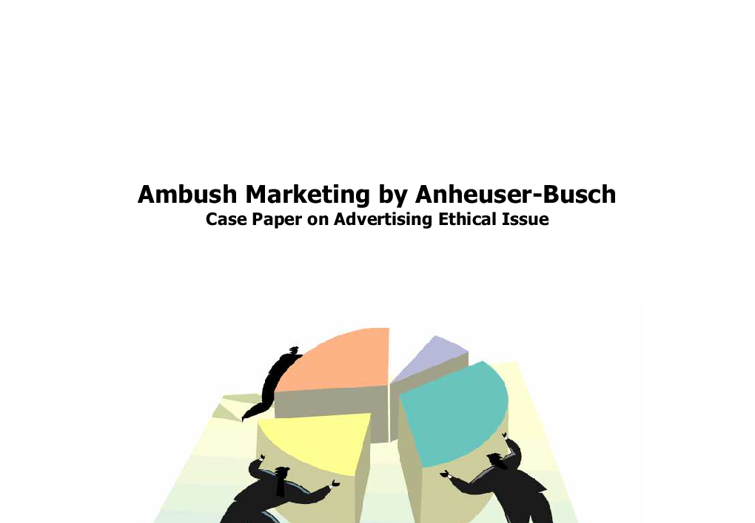 The ambush marketing cases that get the most press are those involving heavyweight brands with massive resources, such as Coors, Anheuser-Busch, and Miller. If Coors was not the official sponsor would they be one of the ambush marketers? Athletes and the Agents of the Athletes Although I did not classify the agents in the same stakeholder categories as the athletes, they go hand in hand. ...read more. Anheuser-Busch has a real interest in taking the attention away from fans of the competing products like Coors. If Anheuser-Busch did not effectively campaign against Coors, there revenues would decline. Anheuser-Busch has a lot of power against Coors and the NFL in its held protected by the law, so long as they do not disregard any laws they should be allowed to compete for business. Ambush marketing although not always ethical, is not against the law. The activity by Anheuser-Busch may be viewed as ethical if they do not intentionally mislead consumers into thinking they are the sponsors of the Super Bowl. Coors set down specific guidelines about the advertising median restriction and if Anheuser-Busch follows theses rules, the stakeholder analysis would say that Coors and the event owner have not been harmed by these actions. Furthermore, Anheuser-Busch has built up the Bud Bowl over many years of effective advertising. They have in essence built an event that the fans recognize and have come to expect. I would think that it would be a good argument on Anheuser-Busch case if the NFL and Coors tried to prevent them from advertising at the same time as the Super Bowl. In effect Anheuser-Busch has built a reputation for itself in regards to the use of the Bud Bowl for its marketing so should be allowed to advertise it. ...read more. Carrying out a PEST analysis involves identifying the key factors external to an organisation that are in a state of flux and that are likely to have an influence on the organisation in the coming months and years. An effective PEST analysis will be based on detailed research using all the latest journals and publications. These top-of-the-line branded products can offer as much as fifty times the profit margin of white rice. In 1991, Gallo handled 200,000 metric tons of white rice. Throughout the 1980s, many companies in several markets tried to enter the value-added branded rice industry. In addition, a significant amount of all United States advertising dollars is invested in miscellaneous media, such as window displays, free shopping-news publications, calendars, skywriting by airplanes, and even sandwich boards carried by people walking in the streets. In the United States a wide range of advertising media has been developed from sources which potential importance formerly was ignored. Modern Concepts in Interactive Marketing This report aims at exploring some of the modern concepts interactive marketing. We shall discuss some standardized models and cite examples of campaigns using the particular model. Advergaming Advergaming is the new tool being used to connect consumers with brands and companies through games on the internet or mobile phones. Opportunities Threats * Brand recognition is the significant factor affecting Coke's competitive position. Coca-Cola's trademark is known well throughout 94% of the world today. The primary concern over the past few years has been to get this name brand to be even better known. The email of the model Tia, for instance, is tia@ckone.com. Moreover, luxury goods are all about exclusive distribution, while the Internet is a mass distribution medium." CKOne's email campaign does not seem to have helped enlivening the segment. The launch of the brand did anyway have a powerful impact on the market. concerns, and by using the language and style of a personal letter. The advertiser also can single out special groups for special appeals. He can be fairly certain that the message will be at least partly read on the date that it is received.